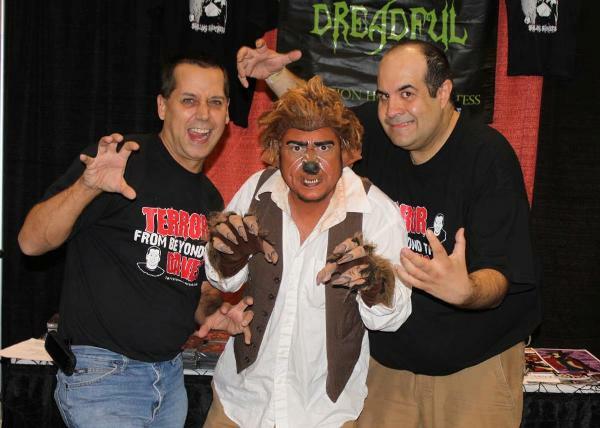 The Terror Daves were saddened at the news of the passing our friend, Magoo Gelehrter, known to most people as Penny Dreadful’s lovable werewolf sidekick, Garou. Both Daves would then meet them at the Rock & Shock convention in Worcester, MA. This was David A.’s first time meeting the duo and was immediately impressed by the chemistry of Penny and Garou. They played off of each other like a comedy team that had worked years together and their quick wit was a rare treat. When asked for an autograph Garou quickly responded like any true werewolf would by coiling back in pain at the prospect of signing with a silver Sharpie. Meeting with these two was definitely the highlight of the Rock & Shock convention and both Daves just could not stop laughing at Garou’s antics. Some time later we were honored to be invited by Danielle and Magoo to their home in Massachusetts. We got a tour of their attic set for the Shilling Shockers television show and were treated to a nice dinner with even better company. Magoo was one of a kind and anyone who was fortunate enough to have met him and spend time with him knows what a treasure he truly was. Whether in character or not, he was a person with a heart of gold who could always make you laugh. He had an energy about him that affected all that were around him. The world was certainly a better place with Magoo in it and he will be greatly missed. His positive attitude and outlook on life was infectious and the few times we spent with Danielle and Garou will be treasured forever. Magoo was recently honored with a “Pure In Heart” Rondo Award and everyone that knew him knew how much he deserved this. Garou was also interviewed right here in 2010. It is a great read and you can check it out HERE! This entry was posted in Horror Hosts, In Memoriam. Bookmark the permalink.